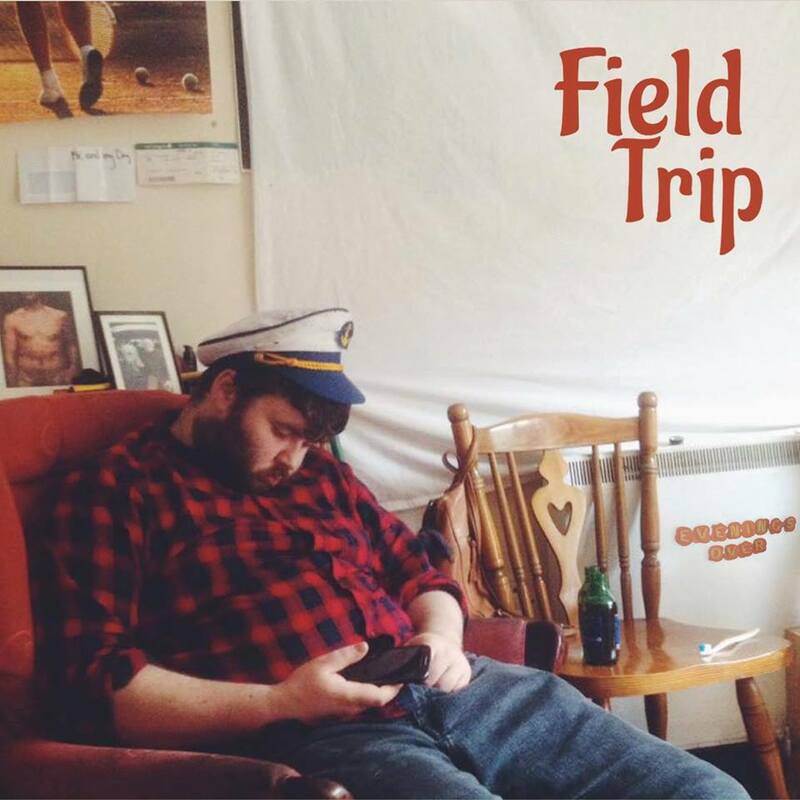 The cover of Field Trip’s first E.P shows guitarist Wayne Foy slumped in a chair, passed out after a heavy night. Early morning light is coming through the window. The party’s over. On the back there is a table cluttered with Bavaria cans, crushed fag boxes, rolly papers, lighters and bottle caps. Somebody has put a Captain’s hat on Wayne. It could seem like a mean joke, plastering a plastered friend over the internet, but the image is strangely affectionate. That feeling of warmth and soft, hungover sadness permeates the music too. The tunes are mumbled at times, hazy and naive without feeling cutesy. Full of primary but faded colours, like a video that’s been taped over a few too many times, so that the technicolor sheen acquires a nostalgic grain. In terms of sonics there’s a good helping of Mac Demarco’s warped sparkle (on Plant the Seed particularly), some early R.E.M. and a nice little dollop of the best of 90’s pop punk. Field Trip have solid fundamentals (shout out to Finn McCarthy’s bass), a great grasp of melody and lovely interplay between the players. In the best possible way it sounds like music made by friends. It’s also the sound of people who have been through the wash a few times themselves. A perfect product of the Galway scene, directly addressed on “Graveyard of Ambition.” A line mistakenly attributed to Dylan Thomas and now Galway’s unofficial slogan. But people wouldn’t stay in the city so long if they weren’t having such a good time and on this recording Field Trip might have the comedown blues but they’re still going to get up and do it all again. I simply want to tell you that I’m beginner to weblog and absolutely loved you’re web-site. Almost certainly I’m planning to bookmark your site . You certainly have outstanding articles and reviews. Kudos for sharing your web page. I just want to mention I’m beginner to weblog and actually liked your blog site. Almost certainly I’m planning to bookmark your site . You certainly come with good articles. Thanks a bunch for revealing your website page. I as well as my buddies were actually viewing the excellent hints from the blog then the sudden came up with a horrible feeling I never thanked you for them. Those guys appeared to be certainly very interested to learn all of them and already have sincerely been using those things. Many thanks for really being so accommodating and also for going for varieties of impressive topics millions of individuals are really desperate to learn about. Our honest regret for not saying thanks to you earlier. You made certain fine points there. I did a search on the theme and found the majority of people will agree with your blog.